The Monnaie de Paris has released the third designs of gold and silver coins which are part of their three-year series dedicated to both the country’s allegorical symbol and official motto. Marianne, as she is known the world over, is the female representation and ideal of France since its earliest days as an emerging republic after the downfall of the monarchy in 1789. She has been depicted many times on French coinage and her image is prevalent in many national buildings, ranging from courthouses and government offices to libraries and museums. 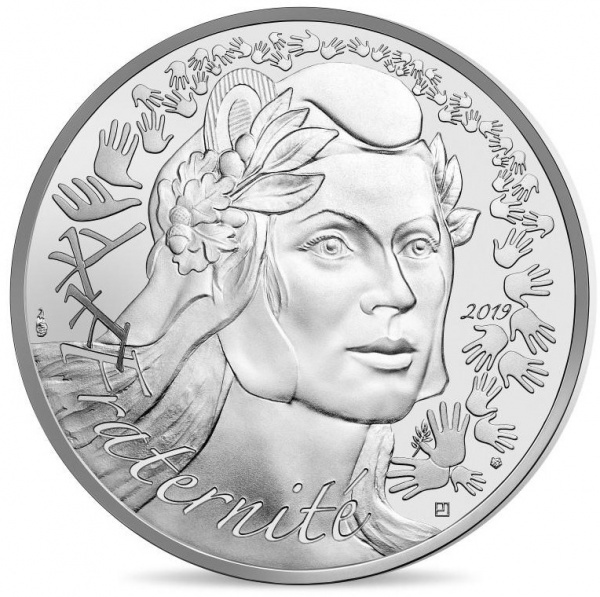 Her image was first included on coins of the new French Republic in 1795 when she was included on the five-centime coin. 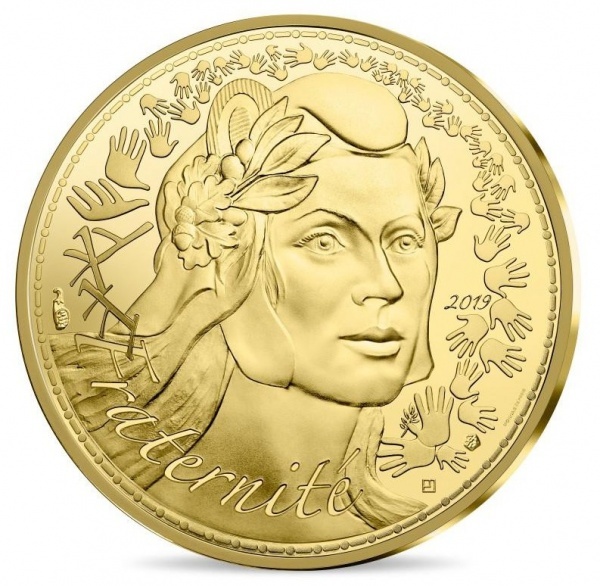 In her latest or more recent transference, her image has been included on French euro coinage since France issued physical coins in 2002. The French motto emerged as a rallying cry after the dissolution of the French throne. “LIBERTE, EGALITE, FRATERNITE” has also featured prominently in French life for more than two centuries. 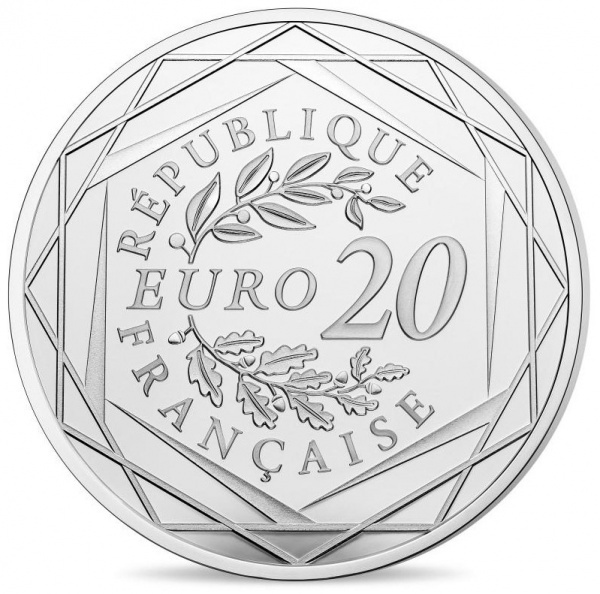 The motto has been integrated onto the reverse side of many French coins since 1849 with the emergence of the Second Republic. 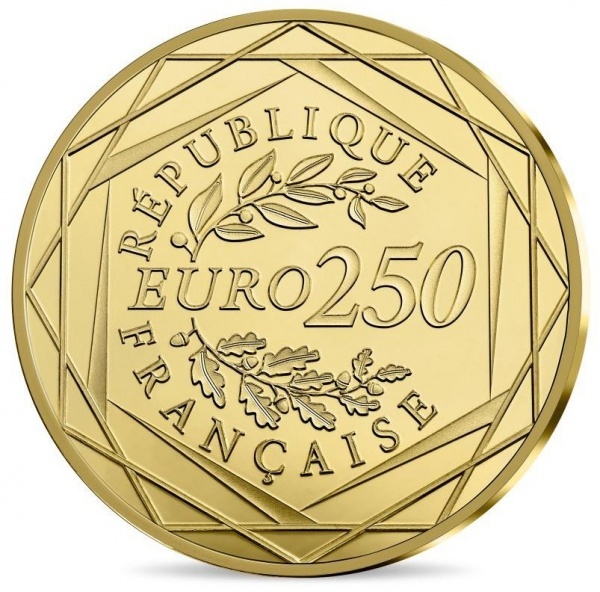 The third coin focuses on the last word of the French motto, egalite (or equality), as the Déclaration des droits de l’homme et du citoyen (“The Declaration of the Rights of Man and of the Citizen”) authored at the height of the French Revolution guaranteed that every citizen of the new French Republic, regardless of their status in society, was considered an equal among equals. 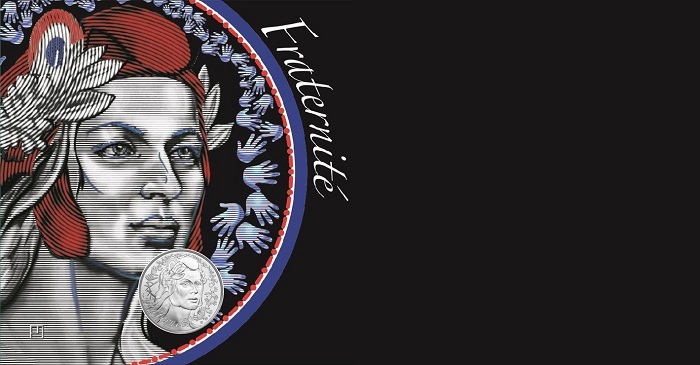 The obverse side of the designs for these 2019-dated coins are shared on all five denominations and is inspired by the bronze medal of Eugene-André Oudiné (1810–1887), an eminent French sculptor and engraver of medals and coins. The new interpretation of Marianne that appears on this set is the work of Monnaie de Paris artist and engraver Joaquin Jimenez, which emanates the indomitable grace and power of this beloved allegorical figure. She is depicted facing to the right, wearing a Phrygian cap, and is also surrounded by an arrangement of handprints, symbolic of the citizens of the nation. The reverse side includes the geometrical design of shapes arranged in different positions and creates a series of borders which encircle the test REPUBLIQUE FRANCAISE and a laurel wreath of sprigs of olive and oak branches. The denomination is arranged in the centre. 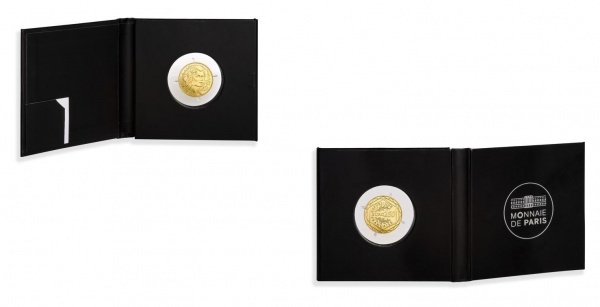 Each coin is available its face value and is individually encapsulated with the gold pieces being presented in a branded Monnaie de Paris folder case. The Trilogy of Marianne is now concluded with the issue of these latest designs. Other years, 2017 and 2018, are still available in a variety of gold or silver options. For additional information about these and other coins available from the Monnaie de Paris, please visit their website.